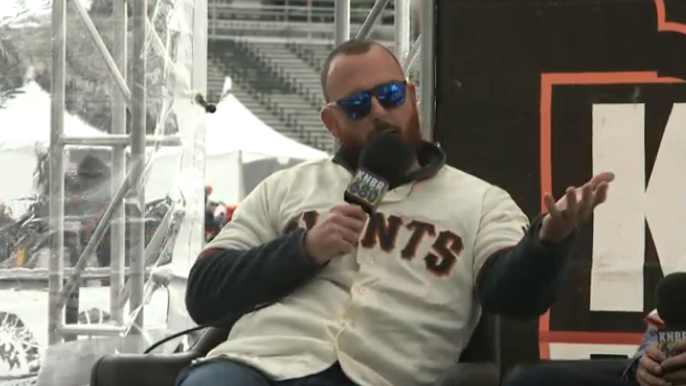 On Saturday at Giants FanFest, pitchers Sam Dyson, Andrew Suarez, and Mark Melancon came on to talk with Marty Lurie and Adam Copeland about everything from getting ready to come into a game, to potentially signing Bryce Harper. Giants reliever and former teammate of Harper’s, Mark Melancon, offered his thoughts on signing the young star. One of the main challenges for many pitchers playing at Oracle Park over the years, especially for relievers, has been getting ready to come into the ballgame during the Bay’s famously cold summers. Giants reliever Sam Dyson remarked on those challenges. Dyson also gave his thoughts on the new trend of teams using “openers” to start games. Giants FanFest is just getting under way! You can watch the KNBR Live Stream HERE!